If you are suffering from nausea or pregnancy induced morning sickness, you may appreciate a quick and natural way to overcome your nausea. Over time, research has shown that ginger is more effective than the common anti-nausea drug, Dramamine, in blocking nausea. A recent study in the Journal of Obstetrics & Gynecology suggests that ginger may reduce vomiting in 63 percent of pregnant women without the side effects associated with prescription anti-nausea drug and doesn’t have any negative effects on your pregnancy. Allergy Information: These products are processed in a plant processes peanuts and other tree nuts. Purchase Ginger Candy from our retail website, BabyHopes.com. 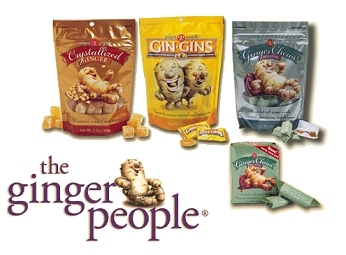 Sampler pack of the terrific ginger candies we carry. Just enough to let you decide what your favorite flavor is so you can come back and buy a full pack of your favorite! These double strength hard ginger candies are made with all natural ingredients. Enjoy them as natural hard candy or put two or three in a cup along with any tea bag and add boiling water. Allow to steep as directed by tea. Gin Gins are also a natural breath freshener. Customer returned to buy three additional bags! Made with the perfect amount of sweet ginger oomph, our Original Ginger Chews are natural, stimulating and delicious. These original Ginger Chews are spicy, soft and chewy and can be used with boiling water to create an instant ginger tea. Named ‘Best Candy’ at the 1999 Scovie Awards. Eating just half a candy can help alleviate the nausea but we don’t think you will be able to stop at just a half! Made with fresh ginger, golden delicious apples, cinnamon and allspice. Spicy Apple Ginger Chews are delightfully spicy, chewy and full flavored. Eat as many as you’d like and don’t feel a bit guilty. Named ‘Best Candy’ at the 2000 Scovie Awards. Customer testimonial – ” Ginger People: I want to thank you for making such a delicious,healthy product. While @ the store the other day I found your ginger chews (original) and I have not stopped eating them!!! I now have found the spicy apple brand OH MY GOSH!! !…..such a wonderful,healthy alternative to a candybar that also lasts longer. I put the ginger chews in some hot H20 when I had the stomach flu on sunday and needless to say they worked great to calm my stomach. Thank you for such a wonderful product. I am looking forward to trying the other products that you produce. Have a wonderful day.” Sincerely Melanie H.
Nostalgic chewy peanut candies spiked with a dash of fresh ginger. Ingredients: cane sugar, maltose (a natural sugar derived from corn), ground peanuts, ginger, vegetable oil, salt. One Peanut Ginger Chew contains 20 calories, 0.5g fat, 4.5g carbs. One Ginger Chew contains around 480mg or 1/2 gram ginger. In comparison, dry ginger capsules contain around 550mg. Customer testimonial – “To all you Ginger People! I’ve been nibbling on your ‘original’ ginger chews for some time now. Have packed them in my suitcase and introduced countless friends and acquaintances when traveling. Today, I picked up your ‘peanut’ variety to try. Oh my. The peanut chew is SUPERCALIFRAGILISTICEXPEALIDOCIUOS – that translates to ‘quite possibly ADDICTIVE.’ Keep doing what you’re doing. I’m impressed. Need a west coast rep? 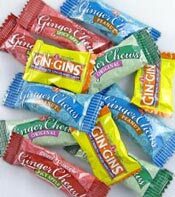 Thank you.” Carolyn H.
Fondly referred to as the “little potion for the motion”, Gin Gins BOOST is a super delicious, super soothing candy packed with a whopping 30% fresh ginger – the most potent candy yet! You’ll enjoy its softer texture and warm ginger kick. Ingredients: Cane sugar, glucose, ginger (30%), modified cassava starch, non-hydrogenated palm kernel oil (trans fat free), salt, soy lecithin.